At his first Canadian canoe slalom national team trials, Hunter Vincent improved by leaps and bounds. “Hunter’s progression through the weekend was awesome,” said mom, Lee Vincent, from Idaho this morning. Vincent, who at 13 is too young to qualify for the national junior team, used the weekend as race experience, rubbing shoulders with the likes of five-time Olympian David Ford. The trials this year were held in Alberta on a lower section of the Kananaskis River slalom course, which was last used for a national competition in 2009 and last hosted team trials in the late 90s. The course has changed a lot since both of the those competitions, even more so with the Alberta floods in 2013 and further man-made developments to the river in the years after. “It was easier back then,” said Alberta high performance coach Michael Holroyd. The weekend’s events were joint trials for the senior, U23 and junior national teams. “We set fairly hard courses with tight offsets,” said Holroyd. In slalom, paddlers navigate through poles suspended over rapids. They must complete the course in the correct order, going through both upstream and downstream gates without touching them. The paddler with the fastest time including penalties – two seconds for touching a gate and 50 seconds for missing a gate – is the winner. The offsets are how much the gates are set apart from each other in the current. There was a high number of missed gates over the weekend, due in part to the high-stakes competition, but also to wind gusts. 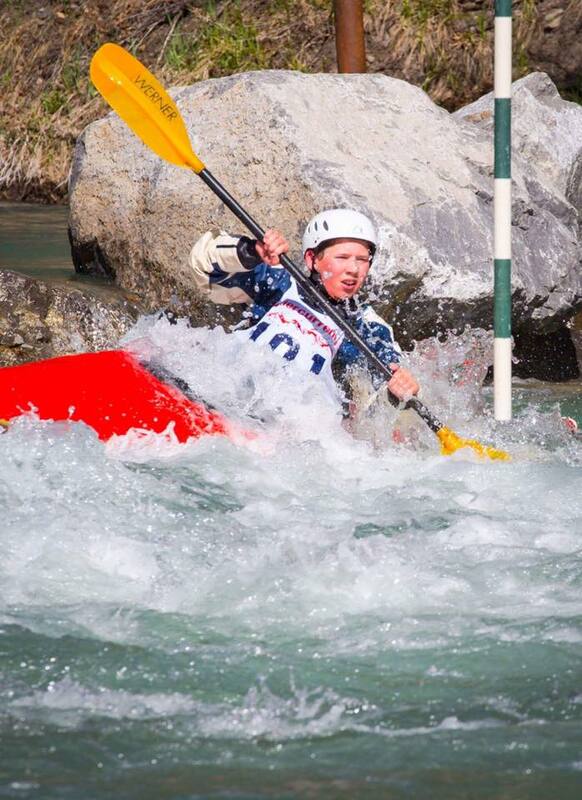 Vincent, racing in two classes – C1 and K1 – progressed over the weekend. He went from missing a number of gates during his kayak runs on day one, to touching only two gates on his final run on day two. “I was able to get pretty much every single gate almost clean,” he said. Vincent has competed at nationals before and won medals. Over the winter he worked with Physio Plus to strengthen his muscles and attended slalom sessions in the pool. Now, he and his family are travelling the states for the summer, stopping to paddle, bike and adventure. Their next destination: a whitewater park in Idaho. Vincent’s next time in a slalom boat will be at the national championships in Ottawa this summer. “I want to keep improving my skill in both (classes),” he said. Joining Vincent at team trials was 15-year-old Mael Pronovost, who had also been training in the pool over the winter. Pronovost, at his second team trials, improved to eighth overall in the junior division. “I was really happy with some of my runs,” he said from Calgary this morning. “Mael has been training hard,” said Holroyd. He has attended camps with the Alberta team in Oklahoma and B.C. this winter and was working to develop consistency over his racing. Holroyd said coaches from across the country were impressed with his progression. In the best three-of-four runs race format, Pronovost’s 7th, 14th, 6th and 8th put him in 8th place overall. On his third run of the weekend, he even had a top 10 finish among the senior and U23 divisions. Pronovost was also the only junior to race C1 and K1 and was only a couple seconds away from qualifying for the junior team in C1. “He did well in C1 for how little he paddled,” said Holroyd. Pronovost had only paddled C1 in the pool over the winter and during one or two days of training in Alberta. Looking forward to a summer of training, Pronovost is anxious to get the training gates set up on the Yukon River at the Intake this week. He said he’s been invited to do some trips with the Quebec team and also plans to do some training at the Chilliwack Centre of Excellence in B.C. His next major race will be the national championships in Ottawa.